UNITED NATIONS, February 24 -- Access to the Internet in 161 countries was compared by the UN's International Telecommunications Union in a recent report, Measuring the Information Society 2010. Inner City Press asked ITU's Susan Teltscher whether her agency considered the quality and content of the internet provided -- that is, censorship -- noting the exclusion from the final data tables of such countries as Turkmenistan, Cuba and North Korea. 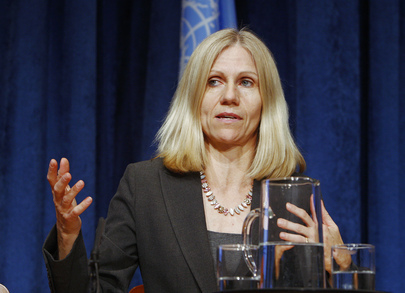 Ms. Teltscher said that ITU did not consider internet censorship. Why not? It "cannot be captured in statistics," she replied. Video here, from Minute 18:18. To some, any UN study of access to the Internet should take into account the varieties of Internet censorship, from China's Great Firewall to more total bans in countries like North Korea. 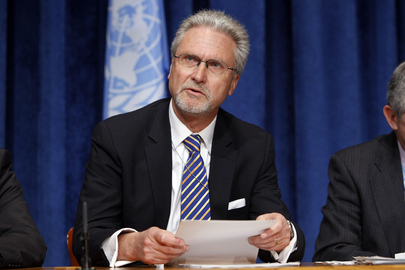 The press conference's moderator, ITU's New York representative, said that the ITU like the rest of the UN system supports Article 19, on access to information across frontiers in all media. But when Ban Ki-moon's two envoys Lynn Pascoe and Kim Won-soo recently visited Pyongyang, they did not even raise the issue of press and internet freedom. Click here for that story. Likewise, in November 2009 when protesters raised a banner about China's net blocking at a UN conference in Egypt, UN security removed the banner. Click here for that story. Question: On Cuba, yesterday, a Cuban political prisoner called Orlando Zapata Tamayo died after 85 days on hunger strike in prison. And people in Cuba and Latin America in general are very shocked by this event and they consider it as a clear human rights violation. My question is, does the UN have a comment on this issue or will have a comment on this issue? Spokesperson Nesirky: The Secretary-General is aware of the case. We don’t have anything to say at the moment. But he is aware of the case. We don’t have anything to say at the moment. Question: But will you say something? Well, Orlando Zapata Tamayo is dead. Even Raul Castro has "lamented" it. But the UN's Ban Ki-moon is aware but silent.